Now, I suspect that this might actually be an interesting boat, to the right person. But what are the chances of that person picking up this calendar, hmm? PS. Can anyone identify the make? A lovely read and another important piece of the jigsaw. Once you get over the rather implausible initial premise, this is marvellous - whodunnit, psychological thriller and more. Multi-layered and complex but never confusing. I couldn't tear myself away. Competent, formulaic police procedural. Set in Portsmouth and the Isle of Wight. This pained detective might start to grow on me. Worryingly, though, as well as multiple murders, a member of his close family seems to die in every volume. Taylor is good. This reminded me of Sarah Waters, menacing, weird to the point of almost seeming supernatural, but all too real in the end. Short, apparently lightweight psychological thriller/love story, but with far more depth than first appears. Glib ending though. McDermid's Kate Brannigan books are a contrast to her darker stuff; an enjoyable, undemanding read. The first of the four Simon Serailler novels, and the best of the three I've read. Marvellously atmospheric, sinister family saga. Another hit from Taylor. In addition this month, I was pleased that J.G. Farrell's Troubles won the 'Lost' Booker. It was the only one of the nominees I've read, and it's a book whose atmosphere left a deep impression on me. While I only half remembered the plot, and wasn't sure of the title or the author, I was so haunted by it I had to seek it out to read again. Harland and Wolff would paint reference marks on plates as they were cut and prepared, so that the platers would know which plate went where as they plated the boats up. They quite often come to light when boats are stripped back to bare metal, and are normally quite easy to read, but I've not seen any cause pitting like that before. I would think that MS + P means plate M, starboard and port. The other thing we have done over the last couple of days is to empty the trailer of all the bits and spares that came along with Chertsey. These include three oil pumps (not including the one on the engine) and, hooray, an oil filler casting to replace the one that got broken. It also includes a wide variety of large and heavy and small and rusty objects, none of which of course must ever be thrown away. All these bits (also including two crank cases, one complete with pistons, and two sumps, but, perhaps thankfully, no spare flywheels (although at least one casing)) have been transferred from a container at Dimmingsdale into Chertsey's hold; out of the hold onto the bank, thence into the trailer, and now finally into our outbuilding. water trying to find it but to no avail, so I had a replacement made. 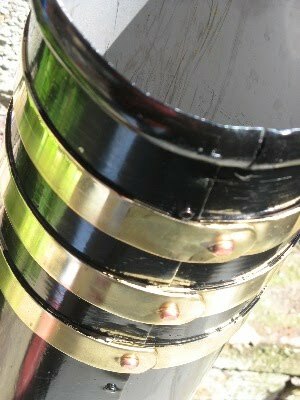 would be that the original was riveted and the replacement was welded. So this is Chertsey's original rudder - now a bit too rusty and fragile to be used, I think I will keep it at home for the time being; maybe even put it on display in the front garden! Richard P. also sent me some more photos of Chertsey, with permission to use them, so I will post them soon. I was sitting upstairs this afternoon when I sensed, rather than heard or felt, a mini shockwave. I dashed to the window and saw that Jim and Aaron had finally succeeded in getting the flywheel off. With the weight of that, and its casing, removed, they were then able to 'walk' the engine to the side of the drive so that the third Volvo could come out. 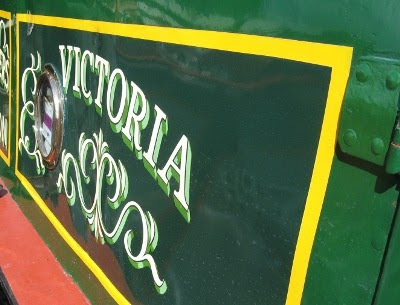 We hooked the electrics up to the trailer and it all worked, so its booked in for an MOT tomorrow, and on that (and a bit of a trial outing) rests whether we will be fetching the new engine up to Chertsey a week on Saturday. It's very frustrating being away from the fray while there's painting still to be done(!) and time moves inexorably on, but if we could collect the engine en route it would make the trip much more worthwhile. A little background... 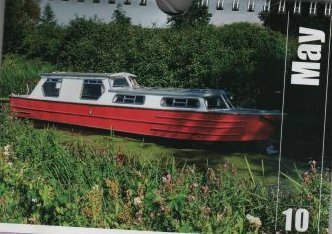 When I bought Chertsey, the engine was completely seized, after decades of not running. We tried various tricks like pouring hot oil down the cylinders etc, but to no avail, so reluctantly decided to replace it with a newly rebuilt one (especially as PD2s come at bargain basement prices compared to Nationals). Then we had the saga of getting the old engine home, which included it having a bit of a fall... and now we are in the throes of planning how we will pick up the 'new' one. This is complicated by the fact that following last week's alternator wire issue, Fang has broken down again. (Fang is the 1988 240 estate. There is also Bluebird, my 1988 240 saloon, and the latest arrival, Tufty, a 1986 240 estate. You need to know this). So we have left Fang (with petrol pump trouble this time, Jim reckons) at Stretton until the local independent Volvo garage man comes back off his holiday. The plan was to go back next time with Bluebird. But Bluebird doesn't have a towbar. Tufty, however, does, and despite having initially been bought for spares (especially its pair of brand new headlights) has done fewer miles than either of the others, and is a 2.3 litre manual (against Bluebird's 2.0 auto). So we thought maybe it would be an idea to see whether it was worth trying to put Tufty on the road. The one hitch with this is that currently between Tufty and the end of the drive there sits... the engine. Having already thoroughly established the impossibility of moving the engine in one piece, we today reached the decision that we (read Jim) would have to start dismantling it, at least enough to reduce its weight sufficiently that it could be shifted a few feet. So off came the starter motor, then the flywheel cover. 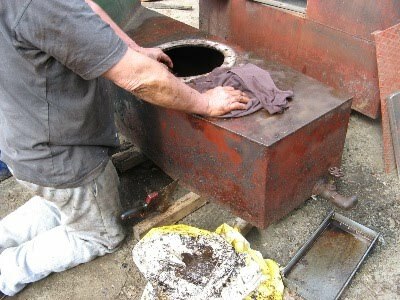 Then Jim went to undo one of the nuts on the flywheel - and the whole thing turned round. After all that, the engine was turning over! No doubt it was its somewhat violent treatment that finally unseized it. At first I could have wept, but thinking about it, it would have to have come out anyway, even if only the top end had needed rebuilding, because you can't get the pistons out without accessing it from underneath. And who knows what horrors we might have discovered and how long it might have taken to fix them. But think also of the logistical grief we might have saved, maybe even money... and Chertsey would have kept its 1960 engine. But it is of course no good crying over spilt milk, and I am confident that the 'new' engine will be better than the old one could have been made given the time and resources available, though I do reserve the right to stomp about muttering 'bugger' for a little while longer. Well, we came home yesterday, having been up with Chertsey for nine days - so a bit of a long week, and oh, how it seemed longer. Not in a bad way; not that time dragged - quite the reverse. I always find that it's the days when you do nothing that seem to be gone in a blink, while the more you cram in , the longer the day seems to stretch to accommodate it. As I sat waiting to leave, I was genuinely taken aback to realise that when we'd arrived the previous Saturday, the diesel tanks hadn't even been cleaned out; in fact, only one of then had been emptied. Yet looking back that seemed so much more than a week ago. And now the tanks are cleaned and scraped out, dried and hoovered, the outsides stripped, rubbed and painted with five coats, their inspection hatches refitted, and even a filler cap made for one of them (by utilising the screw fitting from the external filler which I had removed). 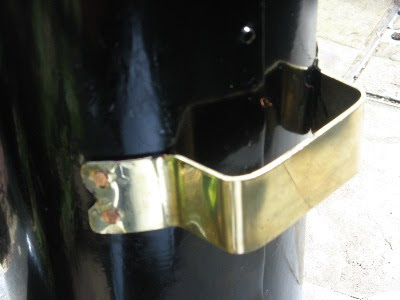 The proper filler caps are beautiful to behold, brass with a lovely shallow groove across the top which accommodate the locking strap and presumably also acts as a key way. But I haven't got one of them. Still need to get something made for the other tank. But they're ready to go back in now (once I've got some more paint down on the engine room baseplate). And a week ago, the only new paint in the engine hole was the red oxide below floor level - now it looks almost finished, although most of it will be getting a second topcoat. Not to mention the work that's been done in the hold, on the cabinsides, and more that I've probably forgotten already, and still we found time (and people) to drink enough beer to fill a large cardboard carton with the empties. We'd kind of reached a natural break in the work, and it seemed sensible to give my cold-stricken lungs a chance to recover away from the dusty atmosphere. When we got back last night I reckon I was as tired as I've ever been in my life. But mentally I feel completely revitalised and able to concentrate on intellectual work with a quite unaccustomed vigour, as a result of having done something completely different for a week, being in the open air and the marvellous sunshine and doing actual physical stuff. So now it's nose back to the writing grindstone for a week or so, try to get the current project finished on this wave of energy, and then I'll be dying to go and get my hands (and arms and legs) dirty again. Well, I finally relented and gave Jim back the ladder so that he could get out of the hold. Sunday was another hot, very dry day, and I decided to take it easy - physically at least - and spent a very productive day reading articles for work. Sitting in the shade - absolutely unheard of for me, but once again discretion seemed the better part of valour. But there was no stopping Jim. 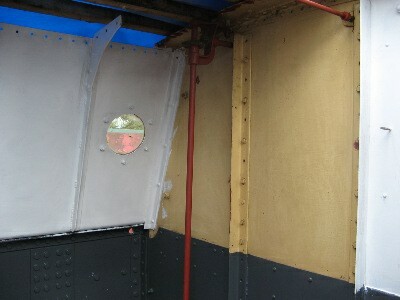 Before I knew it he was Perrago-ing away and by the end of the day the engine room cabin sides were transformed. In answer to Amy's question, here's a post I wrote about the Perago (no wonder you couldn't find it, I spelt it wrong) when it was new. Jim says it's 'not cheap' but that one was about £19, and it's removed an awful lot of paint in its time. Of all the novel tools I've seen, I reckon this one is pretty impressive. Well, summer has finally arrived with a vengeance and I'm certainly not complaining, although it does make for less than ideal painting conditions, especially down in the engine hole. I put that off until the cooler evening yesterday, but it seems it's not just the dust but also now paint fumes that aggravate my cough and from having felt a bit better earlier I spent another uncomfortable night. Now it's bright sunshine outside and - and this is unheard of - I'm sitting in the cabin with all the hatches practically shut, and it's dim and relatively cool. Jim spent most of yesterday back in the hold. Now it's thoroughly dry, he filled in all the rivet holes left when the boat was previously rebottomed. This is to stop water collecting in them, and in the case of the chine ones, to stop it seeping through into the inside of the chine angle, where it would do no good at all. 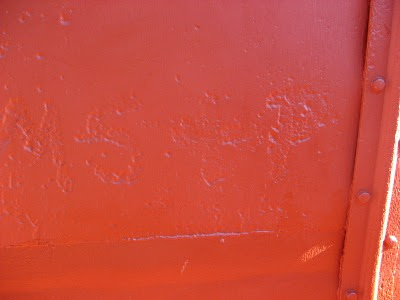 Surely too clear to be coincidence, it looks to me as if something has been roughly painted onto the steel here, and as a result of having more/less/different paint, it has corroded differently leaving a ghostly shadow of what was written - which looks like M S + P. Any ideas as to what, when, why, how? Yesterday we decided to take a break from painting and do something different. It turned out to be a lovely day, although not quite in the way that we envisaged. 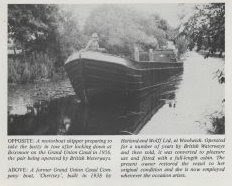 The plan was to go to Market Drayton, to visit a sawmill that had been suggested to us by a local chap, Andy, who was blacking his boat here (we last met him three years ago when he was last blacking his boat here). He'd already rung them up and got a quote for the wood we need for the hold floors, bearers and planks which seemed very reasonable so we thought we would go and see them, and on the way back pop into Newport where we had heard tell there was a shop selling cheap beer. So off we went to the sawmill which is in a village called Hales, near Market Drayton. There's a Hales school, a Hales Club, Hales sawmill, Hales lodge and lots more besides. If I nipped up there in the middle of the night with a few apostrophes hidden about my person I could own the lot. The people at the sawmill were very helpful and positive about what we were trying to achieve, which was a good sign after many frustrating phone calls to timber suppliers all over the country. We ordered the softwood there and then, and then Jim asked, could they get oak? Yes, they could get oak. Air- or kiln dried? Whichever we wanted. Hmm. Can you get iroko? We've got iroko. Ah. Could you cut it to shape, if we gave you a pattern? No problem. This seemed to bode well, but I won't put out the flags until the softwood arrives and we see what it's like... which should be in 7 - 10 days. So very happily we trooped out, only to find that the car wouldn't start. The battery was completely dead. Bit of a mystery, no sign of any problems previously. Jim thought it might be the alternator, so went back inside to call on the goodwill of Hales Sawmill, and very wonderfully, they sent a very taciturn chap around with the forklift to jump start it. We then thought we had better head straight back as being a relatively modern engine (1988) and petrol to boot, it needs a modicum of electricity to run at all, something that hadn't quite occurred to me at the time. So we were going hell for leather, watching all the electric guages going mad, and thinking we might make it, and even stop off at the Volvo breakers on the A41 to see if they had an alternator, when we got stuck behind a tractor turning right and ground to an ignominious halt. What I forgot to mention is that neither of us had brought our phones with us! So there we were at the side of a busy road, half on and half off the carriageway, trying to look distressed, and although it seemed longer it couldn't have been more than tem minutes before a bloke in a transit stopped and asked if we were all right. Now I know that is the standard form of greeting in these parts but he really meant it. Anyway, the upshot was that without further ado he towed us to a garage in Newport (where I think he said his brother worked). In the ten minutes or so at the side of the road Jim had a closer look and identified the cause of the trouble - a wire had come off the alternator; the battery hadn't been charging for ages. It seemed odd to thank our lucky stars for breaking down there, but better than on the way home, on the motorway. The Tan Hill Garage (big plug, lovely people) fixed the wire and supplied a new battery, and when I went to pay the bill, all they charged for was the battery, and that wasn't dear. Our knight in shining Transit wouldn't take a drink either. This is why the day was so good - meeting the sort of people who really do, in the words of the cliche, restore your faith in human nature. And it wasn't over. While they were sorting out the car we went off to find the cheapo shop (I hate supermarket shopping, but I adore independent cheapo shops where you never know what you're going to find) and it didn't disappoint. In fact it was so good we had to go back and get the car before filling our trolley with lots of beer (proper brands from 99p for a 500ml bottle), Pataks curry pastes in obscure varieties you don't find in Somerfield, thai curry sauces, wasabi paste (trust me, I told Jim, you'll love it), an air bed and pump for the guest accomodation and a crisp white cotton sheet for my Chertsey bed, socks and lots more besides. And that's still not all, because on the way to the shop we passed a chip shop where the most lovely couple (very exotic looking (Cypriot, apparently) but broad Black Country (well, she was, he didn't speak but he smiled a lot) were lovely and friendly and sold us really nice chips for lunch. So yesterday was a lovely day, marred only by the fact that come the evening I had developed a really annoying cough that kept me up much of the night and left me feeling quite wretched despite the splendid old fashioned cough mixture I bought in the cheapo shop (It's called B&M and it's where Woolworths used to be if you want to seek it out). Today is very hot indeed, too hot to paint so I am going to settle down and read a book about the Gloucester and Sharpness Canal which I am reviewing for CanalBoat. It's nice and cool in Chertsey's cabin though, despite the blazing sun. One of the benefits of wood I guess. There I was thinking I was putting a lovely cream gloss finish on various bits of the engine room innards (there are articles in various stages of paintedness scattered all over Chertsey's little corner of the yard) and of course what I was really doing was creating some very large flypapers. Hmm. Still, finally opened the last tin of paint yesterday, the dark green, and started getting some of that on. The engine hole is going to look so good (won't half clash with the engine tho, can't help secretly wishing he'd painted it grey) but I'm not showing you until it's finished. Realised of course that we will need more cream and green gloss, both are specially mixed Dulux colours so we will need the code numbers which are on labels on the side of the tins... almost completely obscured now by runs of paint. Lesson nuber three: not the numbers before opening the tin! Please forgive any spelling mistakes today, desperately trying to finish before the battery runs out! Not just the paint, as if that weren't bad enough, but my nose too as this cold moves into the streaming phase.. However, the effects in the paint are more permanent, and so of greater concern. After recoating all the odd bits (and indeed putting the undercoat on the diesel tanks) I put another coat of cream on the engine room ceiling. It didn't actuallly seem so bad to me; it seemed to be mixed fine and although there were of course runs, no more than you'd expect painting round all those bolts and rivets. My main paint-related hatred is reserved for the Dulux white undercoat. Why is it that the grey (same brand) is perfectly fine, but the white goes on like cheese and then drips off onto your head as soon as your back is turned? Horrible, horrible stuff. And I had to do all the top half of the engine room with it. I have at least come up with a new concept of hell: painting a riveted engine room with Dulux white primer. While listening to Radio 1. (If the BBC want to save money they should just get rid of Radio 1. It's positively harmful; it actively encourages idiocy). Anyway, I ran out of paint with two sections to go so sadly had to stop. I'm very tempted to just put the new gloss straight onto the rubbed down old gloss and see if it makes a blind bit of difference not having undercoat inbetween. As (famous last words) there's no more welding to be done now, Jim got cracking with cleaning out all the welding and grinding detritus from the hold. I'd swept up the worst earlier in the week, but he hoovered it all out, and then scrubbed it with soapy water and our new big broom. Today we just have to get the water out and then joy of joys we can put some more paint on it. I think everything related to the engine room (with the exception of the engine breather cover) has now had at least one coat of paint. Hooray! No more wire brushing... just the occasional light Scotchbrite between coats. Jim has even put the first coat of cream paint on the engine room ceiling (Blosson hits the cabin top at this terminology!). It's Dulux paint (albeit mixed in B&Q) but it's awful; terribly thin and keeps leaving oily runs, as if it's not mixed properly. On the upside this gives it an instantly aged look, though I'm not entirely sure that'swhat we're going for. I think the moral of this is, it is worth paying for Craftmaster. In fact it wasn't the cost that stopped us, but the getting hold of it. I have now got a dreadful cold (it's going to foreign parts that does it) which isn't helped by all the dust, so I am more than glad that the worst of the rubbing is over. 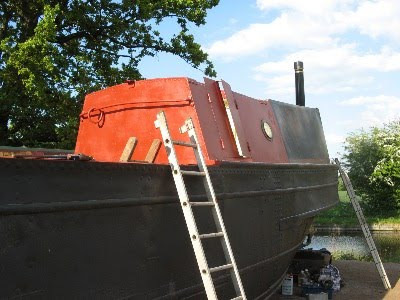 As soon as the overnight rain has dried off I shall be putting some grey undercoat on the faces of the fuel tanks that show, which will be exciting after three and four coats of the red oxide. That Johnstones zinc phosphate, by the way, is a delight to put on. Well, I did put the last coat on the floors yesterday... and then it rained, ruining the finish. So now I have to wait until they're completely dry hard, rub them down, and apply another final coat. 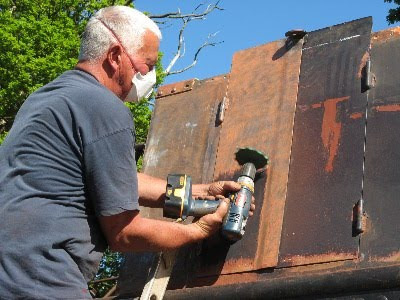 Some more paint went on the tanks too, some white undercoat on the underside of the engine room roof, and very excitingly, Jim cracked open the grey undercoat to do the lower half of the engine room. 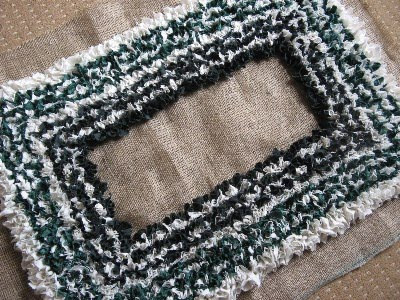 The colour scheme in there will be as it was - dark green up to the gunnel and cream above. I started to sweep out the hold with a lovely new yard broom (which unfortunately occasioned two trips to the shop as the broom heads and handles they stocked were incompatible with each other so we had to get a metal thingy to join them together, but it is very good now), but having established that it should come off fairly easily, I decided to leave it until Wednesday, as there is one final bit of welding to do, to patch some tiny holes in the back end/engine room bulkhead. Instead I went round painting all the gunnel angle, which I had somehow contrived to miss before. Interest was added by the three or so inches of water that have collected in the front end. Mind you, if this weather keeps up, I can see us adding some more and having a paddle. Wouldn't a big Woolwich make a great swimming pool... even I might manage a width in that one. I also started to clean up the portholed vent from the engine room - at least one bit of the boat will be smart if we get to Braunston. What I am very pissed off about is that the porthole glass has cracked. I don't know when or how, but it was OK when we took the cover off. 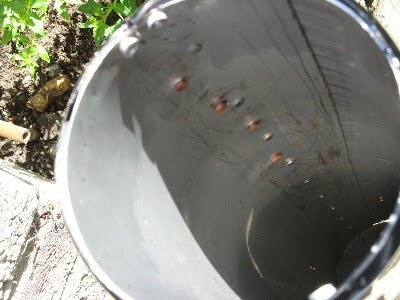 Today's artistic photo by the way is of the second diesel tank once Jim took the inspection hatch off, to reveal a few inches of darkly reflective diesel. Scrape. Wire brush. Scotchbrite. Wipe down. Paint. Repeat from 3 ad nauseum. So far have done two fuel tanks (added first stage of Nitromoors), six floor sections, two fuel tank hatch covers, and the ducting for the engine breather. The floors may actually be finished today! 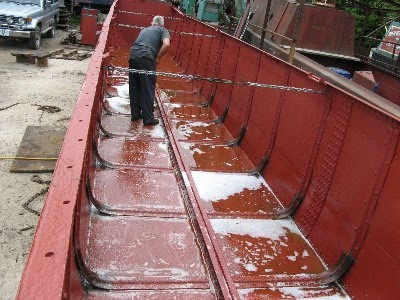 Then we get started in the engine room itself, plus I get to scrub out the hold, where the bright newly painted surface we left is not all covered in rust again.... But never fear, it's only from all the grindings when the knee were done. I've just ordered a load of timber too, for the hold floors and new top planks. Normally it's a sound that I love, but my heart sank when I heard rain on the roof at four this morning... However, it's now bright sunshine, so hopefully everything will be dry again soon and we will be in for a good day. Yes, it's back to the Stretton daily diary, as we continue in the crazy attempt to get Chertsey sufficiently ready to go to Braunston... which will mean leaving here in about five weeks time. With that in mind we decided to concentrate first on the engine room, as having the engine in is a bit of a prerequisite for going anywhere. The new tailshaft and boss have been fitted, and a wonderfully clean and polished prop is in place, which greeted us when we arrived yesterday lunchtime. So Jim got stuck back into the fuel tanks (not quite literally) cleaning out the insides and stripping the paint off the outsides, while I got on with wirebrushing, rubbing and painting the floor sections. 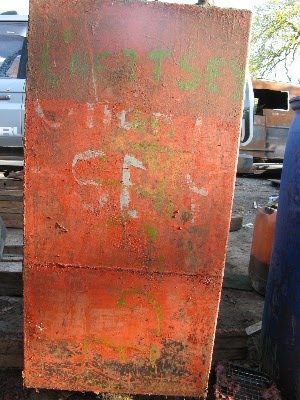 Here on the back of the tank you can see where Chertsey's name has been rougly painted on occasions when the tanks have been removed before - at least three different times by the look of it. No other names on there, so it looks like these have always been with the same boat. There's bright sun shining in on me now, so time to get off the internet and get some work done! 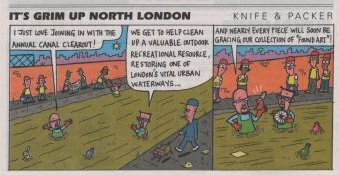 From this week's Private Eye. 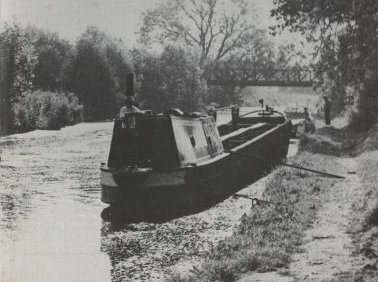 Thanks to another recommendation from Paul, I have got hole of a copy of the Shire Album of Canal Barges and Narrow Boats by Peter L. Smith, published in 1975. This is very exciting, as it appears to contain three photos of Chertsey. This is the first one I recognised - they're a bit like babies; they all look the same to outsiders, but after a while you recognise your own instinctively. 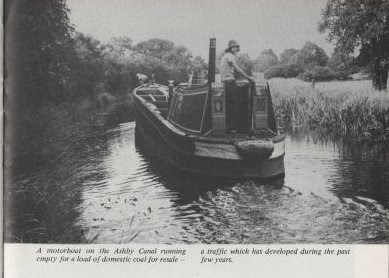 This photo also appears in Smith's Pictorial History of Canal Craft (Batsford, 1979) which I got a couple of days later. Here he gets the build year right (see below), but says the boat's composite. Just goes to show you can't believe everything you read in a book. This would seem to confirm it - a lovely fore end shot, and identified as Chertsey, albeit with a bit shaved off its age. Both of these on the Ashby, where Chertsey is known to have hung out in the 70s. And finally this one - unidentified, and taken on the Trent and Mersey, but I think it's my baby again. Now this is something that's definitely not original. 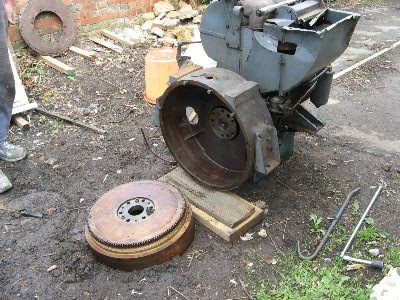 Someone - perhaps Richard Barnett* himself - has put a great deal of effort into making these, and based on progress made with the engine hole slide so far, it looks as if we'll be able to repair and reinstate them. In short, the slides are made from 1" marine ply, covered with (2mm?) galvanised sheet, and then finished all the way round with aluminium D-section. 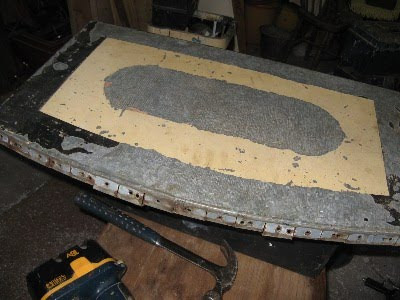 The sheet has been bent round all the sides, and snipped to accomodate the curve. It's in remarkably good condition, considering it's been on there for thirty years or more. Jim has dismantled it, and reckons the tin can be used again. The hardwood runners also seem fine, and the ally edging can be reinstated too. 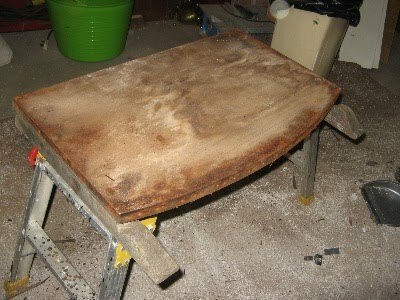 The only bit that really needs replacing is the ply base. It hasn't helped that the edging was screwed into the side of the ply, using ferrous screws - but it was past saving anyway. We did think about replacing it with wood, but thought it would be harder to get that in the right thickness. Marine ply is pretty expensive, but Jim is hoping to get some suitable offcuts from a (sea) boatbuilder friend. Interesting too, to see how the different types/colours of paint have adhered differently - the cream is nearly all still there; the black is almost all gone, and whatever was in the middle (red?) we shall probably never know, as not a trace remains. * I never know how else to refer to him, this distant (and deceased) person with whom I have a rather strange relationship. 'Richard' seems overly familiar for someone I never met, and who by some accounts could be rather prickly; 'Barnett' sounds a bit too dismissive and rude, and anything else is just silly. So in true Quaker fashion, I guess I will just have to continue to give him his full name. 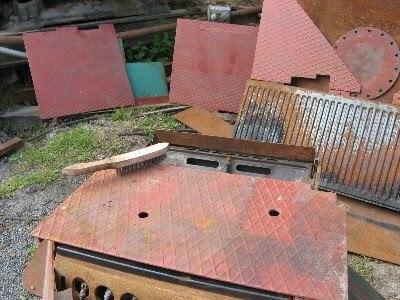 And here is the engine room roof as I first saw it. Have a look at that slide - I'll be coming back to it tomorrow. Anyway, with all the old paint removed and just a couple of coats of primer you can see all the scars I wrote about the other day. 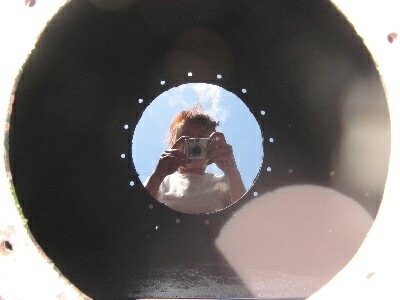 That semi circle at the front is where there used to be a slide, mirroring the one on the other side. That had to be welded up when the air cooled engine was fitted, to make the space for the engine breather. That's the rectangular hole that cuts into the semi circle. To the right of that is the current exhaust outlet - but look at how many welded up redundant ones there are. 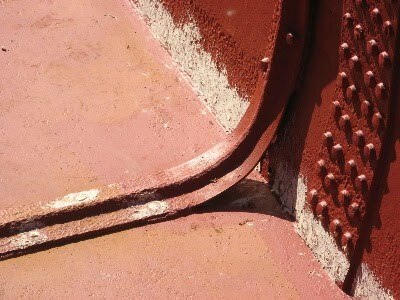 You can see both where the hole has been welded up, and the corrosion that has occurred under the flange. But what is that oval hole to the left of the breather vent, that doesn't have a distinctive flange mark? 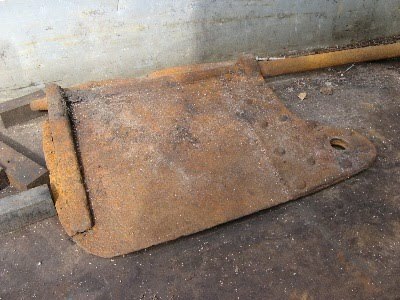 And that square of corrosion to the right that doesn't have a hole? The handrails and runners for the remaining slide are wooden, and still reasonably serviceable. Finally, the vent where the pigeon box should go - but this is now a square one, with a non-opening lid with a porthole - more like a josher's 'biscuit tin' but bolted down. That appears to be a relatively recent addition, all the older photos I have showing a more conventional pigeon box. Making it couldn't be easier. You can mash the bananas, mix in the oil, sugar and water, and then fold in the dry ingredients, or you can do what I did and throw all the wet stuff in the trusty Magimix, followed by the dry stuff. Put it in a lined tin (the recipe says 9", mine was about 7"; it took longer but was nice and tall) and cook it at mark 4 til it's done (mine actually took about an hour; it would be less in a bigger tin). 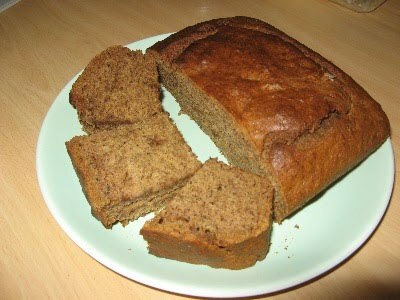 It got Baz's seal of approval too; he said 'it's even nicer than ordinary banana cake'. So if you fancy being vegan, or need to cater for someone who eschews dairy, or just want a really easy, lovely cake, this is it. I must admit I balked a bit when I first saw that the measurements were given in American cups. The first thing I did was look up a conversion (1 cup = 240ml, by the way), but then I thought I would have a look and see if I still had the cup measures I acquired years ago, though I was pretty sure I'd got rid of them. 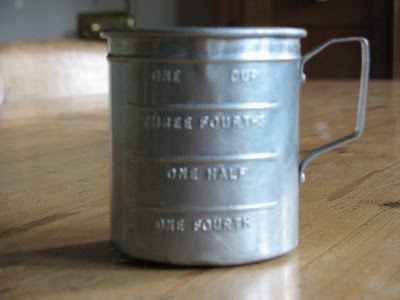 Sure enough I had, but I was delighted to find that this little aluminium cup which I bought at the last jumble sale I went to was in fact a measuring cup. It will now take its place on Chertsey, in case the oven is ever the right temperature for making cake. I'm quite surprised at how quickly I've got this one finished - it's got the same amount of bits in (roughly) as the others; but it's definitely been the quickest yet, despite having a more complex pattern. All I can put it down to is that the vast majority (are we allowed to say majority or is it all too painful?) of the fabric was woven, and therefore could be torn into strips, rather than having to be cut like jersey (t-shirt etc material)does. The downside of tearing - especially velvet - is that it's very messy, bits and fluff and threads everywhere. But it is a lot quicker. Of course, it looks a lot neater on the back. Looking for something to do with my hands whilst listening to the results coming in on election night, I decided to get on with Chertsey's first custom-made rug. It was along night, as I was determined to wait for the result from Brighton Pavilion, where the Green Party had its first real chance of securing a seat (which of course it did, hurrah). It was interesting not only because I have a great deal of time for Green politics, but also because it's a nearby constituency (next door but one along the coast). You may not still have been up, but that result finally came in at about six a.m., after I'd gone round the house opening the curtains again and was just sitting staring rather fixedly at the computer screen, having augmented Radio 4's coverage with the rather good Guardian election blog. By then I'd run out of bits of stuff, but after a couple of hours sleep I cut up some more and continued podging whilst watching (well, listening to) events unfold. 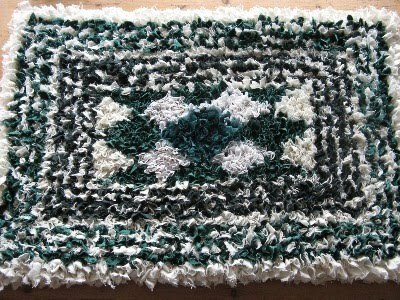 Now, I already have a rug in Chertsey's cabin. This is the very first one I made, which sat safely, untrodden, on Warrior's side bed until someone (ahem) put a creosote (substitute)-soaked fender down on it. This was a blessing in disguise really as it meant it could now be used for its proper purpose. It is now filthy, but does an excellent job of trapping dirt and stopping it getting all round the cabin. This new one will, for now, be for best. The plan is to keep it on the bed during the day, and only put it down at night as a treat for my bare feet. Eventually it will get grubby, or some accident will befall it, and it will slip down the rug league to be replaced by another interloper at the top. But I suspect it will still be there long after whatever government we get out of this intriguing situation is long gone, and hopefully it will remind me of that momentous night. It's not exactly designed not to show the dirt, as I have based it on the cream and green paintwork of Chertsey's back cabin (and indeed engine room). Baz may notice when he next changes his bedclothes that his cream wincyette sheet has disappeared. However, as he only changed them last week I should be safe for about six months yet.... It is so far in my standard concentric oblongs pattern, which is what I do because I never know in advance how much I'm going to have of any particular fabric, which makes planning patterns difficult. I think I'm going to be a bit more ambitious this time though and perhaps go for a diamond pattern in the middle. After poring for a while over that photo of Chertsey in the Roger Alsop book (and I've since had further confirmation that Chertsey was indeed there at the time), I decided to compare it with some of the few other photos I have. The first one I looked at was this. 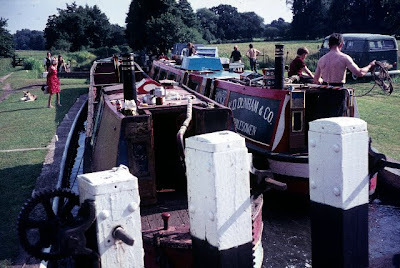 This is Chertsey on the River Wey, on the way to or from the National Rally that year (I have the plaque too). I can be fairly sure this is the real thing, not only because of the plaque, but because I was given it by the Turners who got it from Richard Pearson, who was Richard Barnett's business partner. This is definitely the same boat as in the Harry Arnold Gopsall photos which I dare not reproduce. Even the Brasso tin is still there (though it has been moved from one side to the other). Has something awful happened to the tiller, or is that an optical illusion? One thing that is fascinating me is the engine situation. When built, in 1937, Chertsey was fitted with a National DM2. 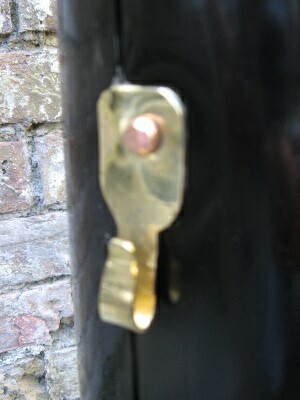 In 1960, a Petter PD2 - the one we have just removed - was fitted. 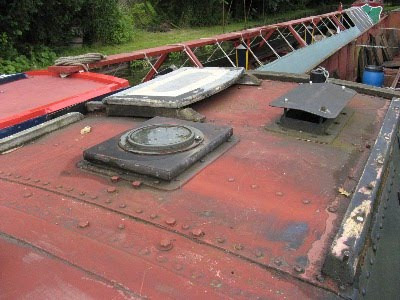 But the scars on the engine room roof suggest that at some point a third engine was fitted. This would have been prior to 1960, so might have been by GUCCCo or by BW (Ownership passed from the former to the latter upon nationalisation in 1948). I need to do a bit of digging to find out if and when GUCCCo started replacing engines - I know that information is out there and shouldn't be too hard to find. 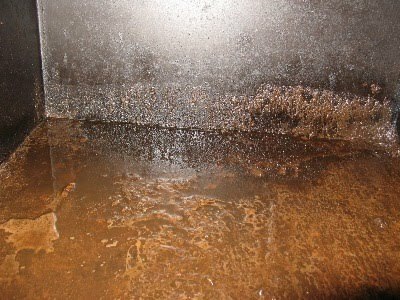 But I am also intrigued by what I found in the pictures regarding the cabin. 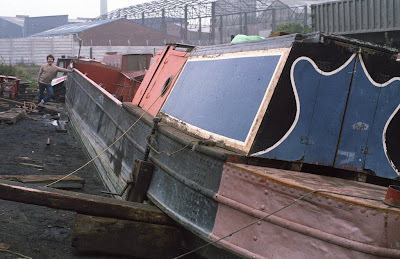 This much I know: Large Woolwich motor boats were built with wooden (softwood) cabins (unlike their Northwich equivalents, which were all-steel). BW's practice once the boats were in their ownership was to replace these (as they needed replacing or repair) with plywood ones, which lacked the nice lines of the Woolwich ones. At some point, Richard Barnett rebuilt Chertsey's cabin... from solid oak. The story has it that this wood was salvaged, in the form of shelving, from Colne public library. It was probably intended to function as a wooden cabin; it is double thickness. However (most likely, I guess, because it leaked) he had this solid oak cabin skinned in steel by Les Allen. That is the cabin it now has. But the photos (assuming I have their chronology correct) have thrown up some interesting questions about the cabin. For example, in the Wey photo above, and in the Gopsall photos, you can clearly see that the cabin has side vents. These were standard in the Woolwich cabins, but I don't know if they were reproduced in the BW ply ones. Now, here are two later photos, very kindly given to me by Richard Barnett's widow. The first, really beautiful, one (of which sadly I only have a rather poor print, which I have just scanned) was, she told me, taken in 1973. The second one I don't have a date for, but the style of clothing sported by Richard (for it is he) suggests that it is a little later. What intrigues me is that it clearly still has a ply cabin here - i.e. Richard hasn't yet got around to replacing it; perhaps he is just about to - and it is the same one as in the 1973 photo, but not the same as in the 1970 ones. How short-lived were they - would he really have replaced it twice between 1970 and the early eighties? 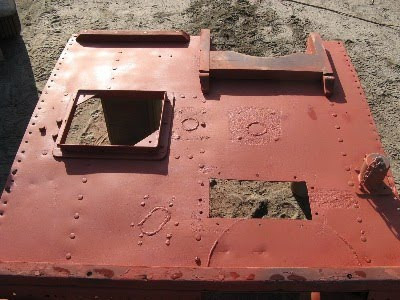 Although it is possible, because it is now clear in the 1970 photos that the paintings inside the rear hatches are not the same as it has now, but by 1973, they are in place. One further thought - I suspect - and, of course, like to think, that some of the oak framing inside Chertsey's cabin is original. At first I didn't believe this could be possible, but what made me wonder is the fixings revealed when we removed some moulding by the back doors - great brutal metal spikes. They just don't look like they would have been in use in 1970. Someone whose opinion on wooden cabins I would respect said he thought they could be original. And it does seem that the ply cabins were built on the original framing, so unless it was damaged (and it's 4x4, roughly, oak) there would be no reason to remove it... unless you were replacing the whole cabin with a steel one. A fate which Chertsey, I think thankfully, has avoided. When people find out what I do for a living (I'm a Politics lecturer, for anyone who didn't know), they either glaze over and change the subject, or show a polite interest by asking who I think is going to win the election. To be honest, I have no more idea than the next person. I'm not a psephologist (the statistics makes my brain hurt) although I love going to the psephology sessions at the Political Studies Association conference in the same way as I used to like watching Open University broadcasts on a Sunday morning, to immerse myself in something completely incomprehensible but somehow nonetheless interesting. I'm not even sure who I want to win the election, national government-wise. The prospect is pretty depressing whichever way you look at it. 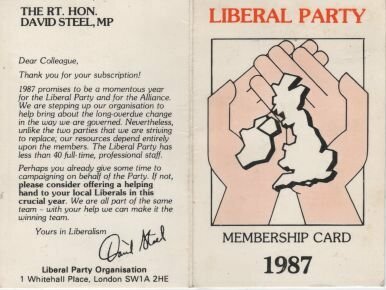 It's no secret that I'm a liberal, and indeed, was a Liberal - I joined the party in 1987, the year before they merged with the SDP to become the Liberal Democrats. Socially, I believe in maximising individual freedom, privacy, human rights and human flourishing - for which a redistributive welfare state is a prerequisite. Economically I believe that the free market is an inevitable outcome of that individual freedom, and indeed, has its good points - but that it also has potentially harmful effects, including gross inequality, exploitation and environmental degradation, and that these need to be mitigated by the government acting on behalf of everyone. Obviously, lots of people hold very different fundamental views, and I'm not looking to engage them in argument here. But given that that is what I hold dear, what electoral outcome should I hope for tomorrow? How I cast my own vote is an easy choice. I have a green-tinged liberal Lib Dem MP, whom I first campaigned for in 1992, and who was first elected in 1997. I can very happily vote for him (despite his lack of social skills and clean ties). But - apart from a lot more Lib Dem MPs, which I suppose would be a good thing, and a Green MP elected in Brighton Pavilion, which would be a brilliant thing - what should I hope for on the national stage? One of the biggest issues for me is ID cards. The Tories say they will scrap them. But do I believe them? In my guts I simply don't. No government in power, unless it had a really strong, visceral, ideological opposition to the very idea, could bear to pass up such a wonderful toy. I haven't forgotten that Michael Howard wanted to introduce them in the eighties; it was principled and powerful opposition from Labour that stopped him. 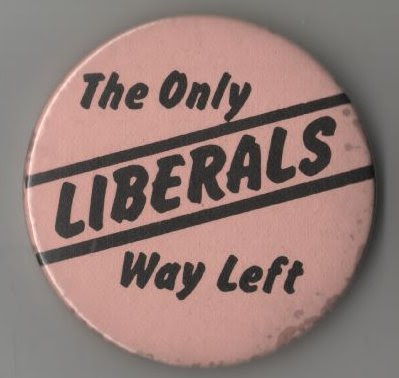 And that brings me on to my own, small, theory about who should be in power, if you are of a lefty/liberal persuasion. All governments, by their very nature, by the very experience of being in power, tend to be authoritarian, and tend also to be conservative. Therefore, might it better to hope for a Conservative government, with a strong, principled, leftish Labour (or Lib Dem, or both) opposition to keep them in check... Because when Labour are in power, and corrupted by it, there's no-one to stop them. It's spend, spend, spend now (well, until the money runs out). 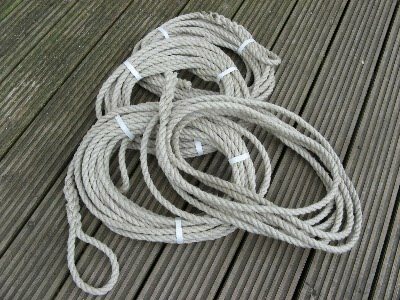 I've just taken delivery now of some ropes (sorry, lines) for Chertsey. Or some rope in the form of lines, perhaps. I decided to get Hempex, as that is what we have on Warrior and I have been very pleased with it. It looks good, it's long lasting, and it's comfortable to hold and use. We bought Warrior's at Crick, three or four years ago, and we had it in our minds that it was 14mm, so that's what I ordered this time. Unfortunately, it turns out that what has come isn't quite 14mm, but 1/2 inch, and it looks quite a lot thinner than Warrior's - although I suppose it may get fatter looking with age. 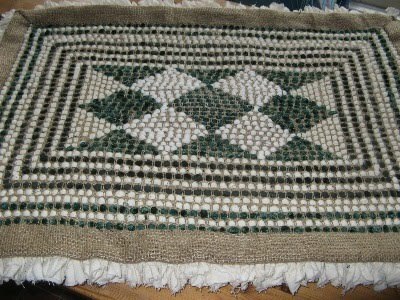 Anyway, I think I will stick with with it for now, especially as it is in lengths, already spliced (yes, I know, I really must learn to do it myself). What lengths of rope you should have, for handling and tying up, seems to be a matter of some controversy. Based on my experience on Warrior and Tarporley, I've gone for four interchangeable 10m lengths; one for the front, one for tying up the stern, one for the back end and one for spare - which can be joined to one of the others if I ever need a longer one. 10m might seem a bit long for tying up, but I'm working on the basis that it's easier than faffing about with separate ropes for that, and sometimes I'm not going to be able to get close into the bank. Also it's good to be able to take the rope back to the boat after tying it off, and when using a ring I like to just put a loop through rather than the whole length of the rope as it makes casting off from the boat so much easier. Ideally, I'd probably even have liked them a bit longer, but that might just be me. Only experience will tell me if I've got it right. By the way, a quick update and a good word for Trafalgar Marine, who we ordered it from. Jim rang them up about it and they were very helpful, including offering to take it back. The guy checked and agreed that it wasn't 14mm, and said that they would send the whole lot of their remaining stock back to their suppliers. Meanwhile I've decided that it looks fine from a distance, and as it was a special offer I'm sticking with it. 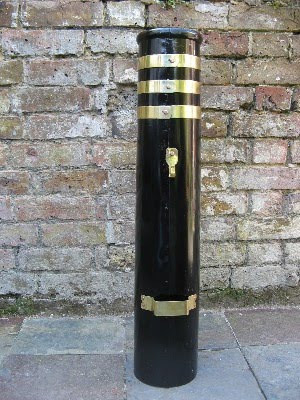 One of the things we did at the Little Venice Cavalcade was to collect the chimney that I have had made for Chertsey. It's quite difficult to get hold of a traditional-style stove chimney; mass produced versions are not only flimsy, but far too short. 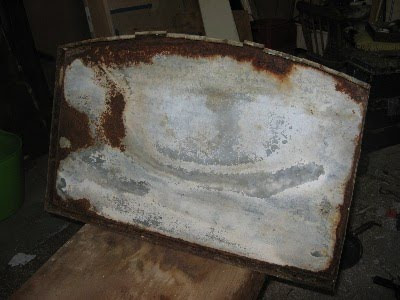 If you were standing next to it all day, you definitely wanted something that would carry the smoke way over your head - so working boat chimneys tended to be around 30" tall - and were often extended further with an old tin; traditionally a National dried milk tin. (I do in fact have a suitably ancient Ambrosia milk tin, but I am a bit loath to chop it up for this purpose, and anyway, being a shortarse, I probably don't need to). At least one person who used to make old fashioned chimneys has recently stopped, but someone else has stepped in - Mike Pinnock (junior), of Clover and Fazeley, who Jim found through CWF (yes, CWF saves the day once more). Mike is happy for me to pass his number on to anyone who's interested in getting a chimney made, so do let me know if you would like it. with brass bands and aluminium D-band around the top. It's single-skinned, so I may need to think about putting a liner in it. I'm very pleased with it. The finish isn't perfect, but then I wouldn't want it to look like a mass produced thing. It's solid and chunky and handmade, and I think very fitting for Chertsey. I can't wait to go up and put it on, along with its chain - and see whether my careful measuring was accurate. I shall also be measuring up for the engine exhaust pipes, and putting in an order for them next. Thanks to Paul H. (will chimney pics tomorrow do Paul? I just went out and took a load, then realised that I've only got one usb lead and it's currently connecting my computer to the phone on account of the router finally having thrown all its toys out of the pram and awaiting the attentions of a fat man with a greasy pony tail)... 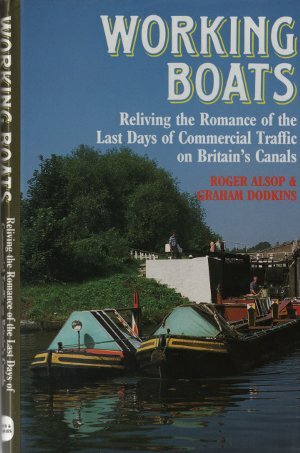 Anyway, thanks to Paul, I just bought a copy of Roger Alsop (and Graham Dodkins)'s book Working Boats: Reliving the Romance of the Last Days of Commercial Traffic on Britain's Canals, published by David and Charles in 1988. Roger Alsop worked (briefly, it seems) for Willow Wren in the mid-1960s, and the book describes his attempt, 21 years later in 1985, to recreate a typical trip, to see whether it could still be done, and in the time demanded by the company. 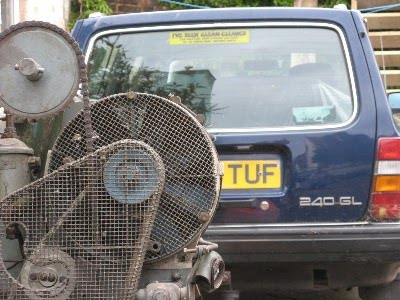 He tracks down the original motor (Comet) and one of the butties he used (Barnes) and persuades their owners to allow them to take part in the adventure. The book is then an account of the 1985 trip, interspersed with flashbacks to the 1960s, comparisons with then, and little nuggets of information. It's striking to think that another 25 years has elapsed since he made his nostalgic journey. It's a slim volume, easily read at one sitting, with lots of superb and moving photos. If the text does sometimes get a little confusing as to whether we're in 1964 or 1985, that's a small price to pay; it's well written, very atmospheric, and above all affectionate. Romance? Well, it seems bold to put that in the title, when we're all supposed to know that there's nothing romantic about seventeen hour days, backbreaking labour, and coal dust in everything, but in a way it is honest; there will always be something romantic about something that's been lost, no matter how appalling it was at the time. Just look at coal mining. The book's primary recommendation was that it has a picture of Chertsey on page 22. I have pored long and hard over this, and yes, it certainly could be Chertsey, loading coal at Gopsall Wharf in 1970, bound for the papermills on the Grand Union, in the very, very last days of this traffic. The photo is one of a series taken by Harry Arnold, of which a couple of others were reprinted in the HNBOC newsletter before last (2009/4). I wrote to Harry Arnold to enquire about acquiring copies, but as he runs a commercial photo library, the cost and copyright restrictions (both perfectly understandable) made it hard for me to justify the outlay. However, he seemed certain that the photos are of Chertsey, and I think I will get back and ask him if it is actually positively identifiable in any of the shots. I'm not sure it was even displaying a name at the time though! But even if it hadn't had this fascinating photo, the book was still a wonderful read, and thoroughly recommended. Abebooks were showing quite a few copies, at least one other one priced, like mine, at 65p. Very well worth it - many thanks for the tip Paul. Aside from that failing on my part, and a rather unpleasant lunch (of which more later) it was a splendid day out, up to and including the final downpour that accompanied us on our way back to Paddington. We were delighted to meet and spend much of the day with Carrie (Blackbird), Simon (Tortoise) and Neil and Kath (Herbie), fellow bloggers and all lovely people. We found the beer tent (and somehow seemed to have trouble shaking it off...) and sat for a long while watching the world go by, including waving to Mike as he steered Prince Regent past us. Then I went off to collect Chertsey's new (indeed, only) stove chimney, very handsome and handmade, which I proceeded to carry around like a (rather shiny and cylindrical) baby for the rest of the afternoon. We went back for a tour of Tortoise, then back down to the visitor moorings to see Herbie's fantastic new paintwork and have a cup of tea, and then, as we were on the verge of leaving, were persuaded to return to Tortoise for a curry cooked by Simon, which was really lovely. Made it back just in time from our jaunt to the Little Venice Cavalcade, where we had a most enjoyable day, saw some old friends, met some new ones, got wet, and collected a chimney... More about that tomorrow. 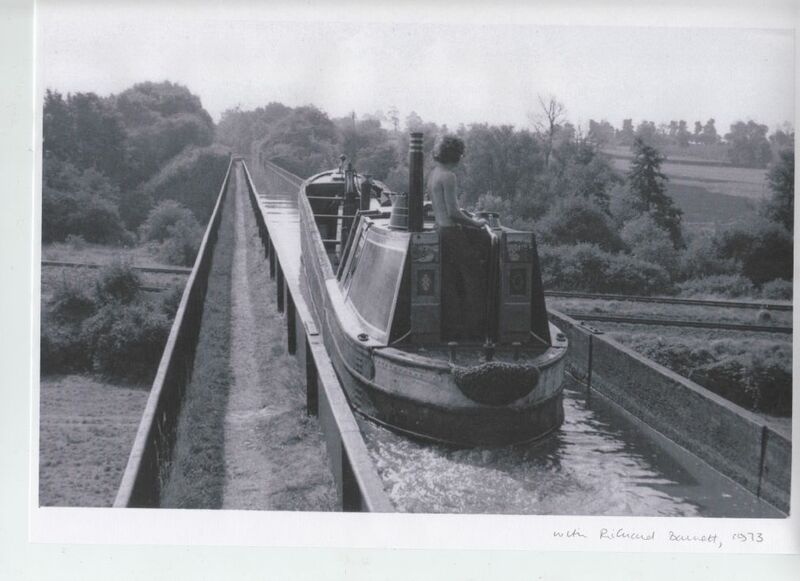 And when I got home, another treat - the copy of Roger Alsop's Working Boats that I'd ordered through AbeBooks for the princely sum of 65p had arrived, complete with wonderful photo of Chertsey in 1970.